Which Redarc Smart Battery Isolator is Right for You? Founded back in 1979 in South Australia by electronics engineer Robin (Bob) William Mackie, Redarc have made a name for themselves as a superior brand in automotive electronics, which now includes their quality dual battery isolators! Over the last few decades, they have proven themselves as top contenders in the global car parts market, offering world-class solutions to keeping vehicle electronics in prime condition. They manufacture quality ignition systems, voltage converters, battery chargers, and (of course!) battery isolators. 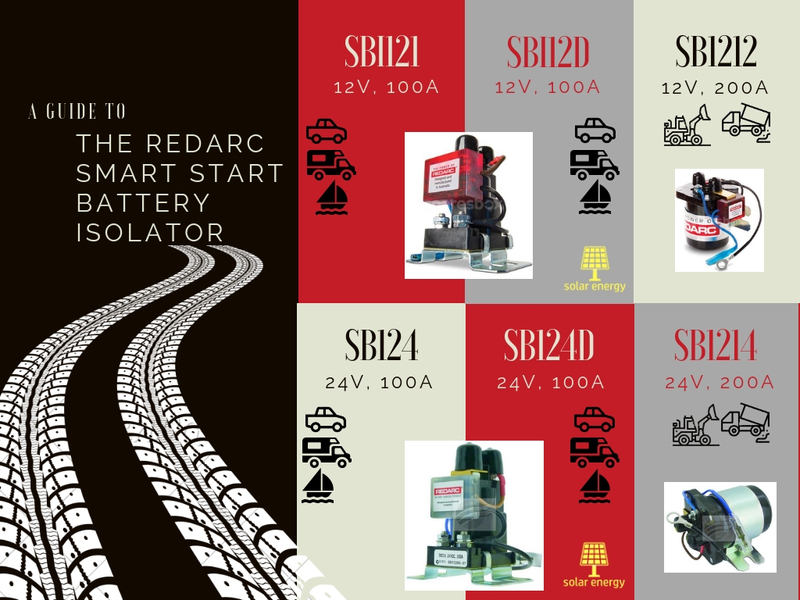 Read on to find out more about the Redarc Smart Start Battery Isolator range, and how it’s the best investment to keep your start battery safe! Why Do I Need a Redarc Smart Start Battery Isolator? Are you an avid 4x4 driver? Do you operate commercial vehicles? Or do you use a dual-battery setup? If you answered yes to any of these questions, then you’ll know how important it is to protect your start battery from excessive discharge – this is where the dual battery isolator comes in! Redarc’s Smart Start Battery Isolator will protect your main battery, while allowing the auxiliary battery to supply power to non-essential loads. It ensures that a low charge in the secondary battery won’t drain the primary battery, while also monitoring the start battery and charging system. 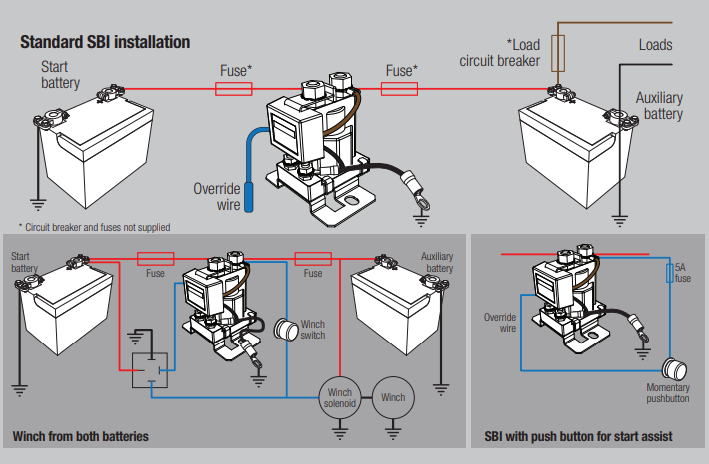 This means the solenoid will automatically connect the aux battery to charge once the start battery reaches a set number of volts. When you’ve turned off the engine, the Smart Start Redarc battery isolator continues to monitor battery voltage, turning off the solenoid and again isolating the start battery when it drops under a set voltage level. Which Redarc Smart Start Battery Isolator is Right for Me? Choosing the right Redarc battery isolator is pretty simple, you just need to ask yourself one question: what am I using my new Redarc battery isolator for? If your answer is that you’re just needing the battery isolator for 4WD, camping, caravanning, RV, or marine applications – or anything else with a similar load – then one of the 100A continuous-rating dual battery isolator models will suit your requirements perfectly. These 100A models are SBI12 and SBI24, with the only difference being the turn-on and turn-off voltage – do you need a direct current of 12 or 24 volts? If you only want to power small appliances, such as lights, then the 12V Redarc Battery Isolator (SBI12) will be right for you. If you need to power fridges, freezers, televisions, etc, then the 24V Redarc Battery Isolator (SBI24) is your best bet! Now, having said that, the game changes a bit if you’re going to be using solar, or another external-charging source like an AC battery charger. To utilise these external power sources, Redarc has created awesome dual-sensing battery isolator models. They isolate the start and aux batteries and, during operation, simultaneously allow the aux battery to be charged by an external source, like solar! So, if you have solar panels, opt for the SBI12D or SBI24D (the other specs remain the same as the previous models). If your answer to the very first question is that you need to use your dual battery isolator for extremely heavy-duty operations, such as those found in industrial and mining settings, you need to look at one of the 24V models – SBI212 or SBI224. If you don’t trust our humble opinion of the Redarc Smart Start, history says it all! Taking away over 30 national and international awards since 2001, Redarc have a backing of extensive industry research and technological innovation that make them one of the best companies in the world for auto electronics – coming from right here in Australia!